Coming from the Philippines where the end of each day is blessed with fiery skies, sunsets in Malaysia are a bit of a letdown. 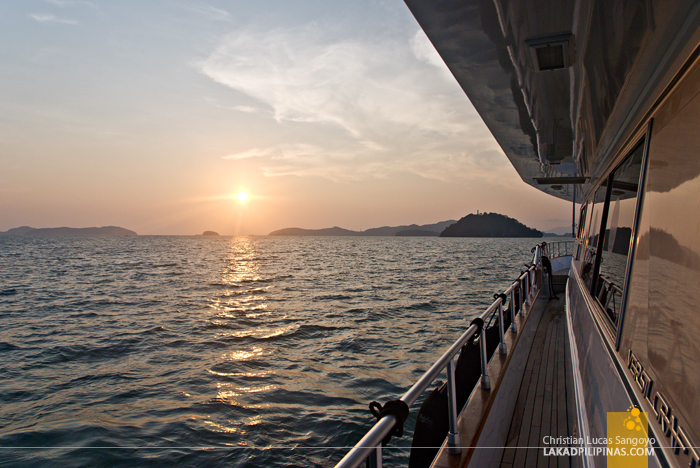 It was a different case, however, when we sailed across Kuah Bay, along the Andaman Sea, one lazy afternoon in Langkawi. The sun was quite feisty that day. 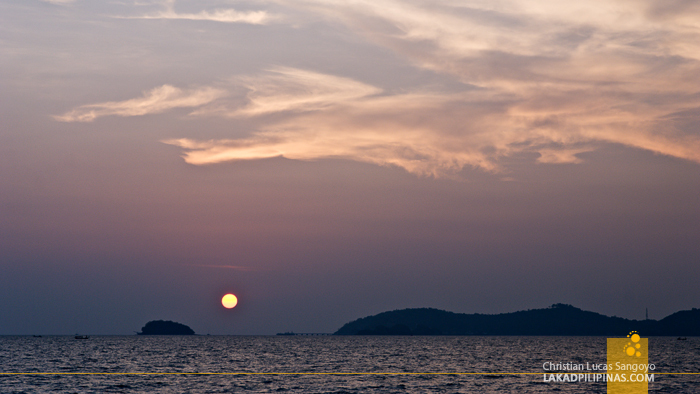 We watched, enthralled, as that ball of fire went down, painting the sky and sea in orange hues while we sipped wine and guzzled Tiger beers aboard a 55-foot luxury yacht. The morning’s Tanjung Rhu parasailing activity left us on a literal high and after resting a bit at Hotel Bahagia, we were again fetched by a van to cap the day with a sunset cruise. 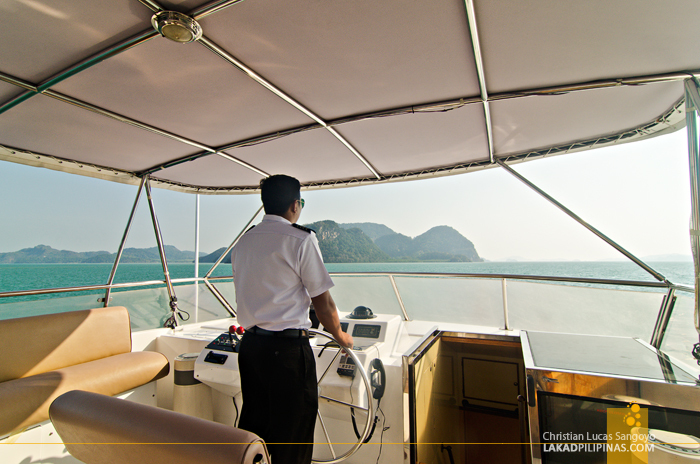 Arriving at the Royal Langkawi Yacht Club, where the boat was docked, we waited at their comfy lounge as other guests trickled in. Less than five minutes later and we were being led to the docks where our ride awaited. 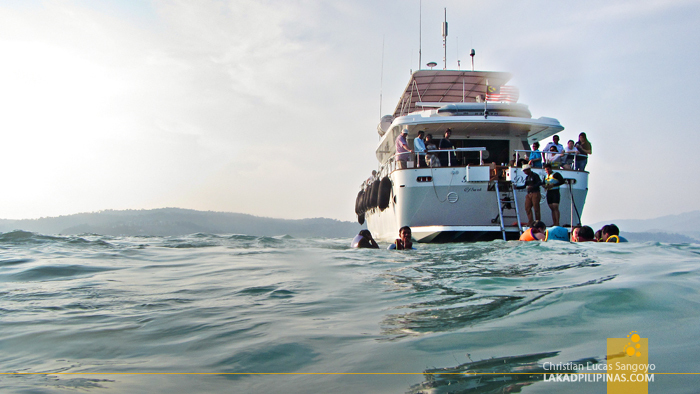 We booked the activity via Naam Cruises, the same guys who set us flying earlier that day. 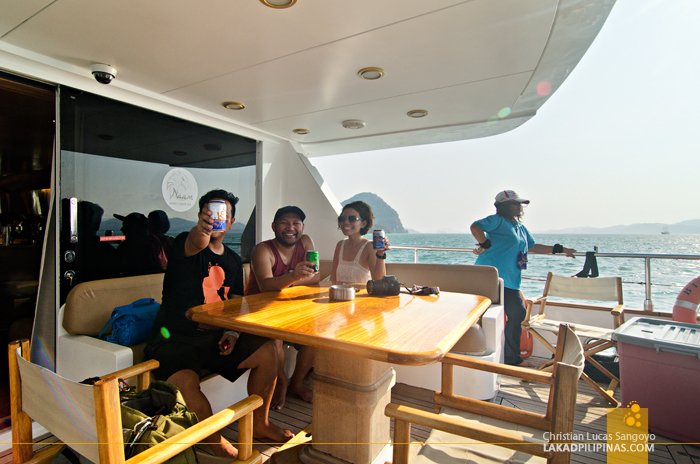 The tour includes a cruise around the Andaman Sea, snorkeling activity, buffet dinner with unlimited drinks—and that means wine, beer and soda (for non-alcoholic peeps)—inside the luxurious Sea Falcon catamaran. Those last two sold us in. Removing our shoes and flip-flops, we boarded the ship barefoot. 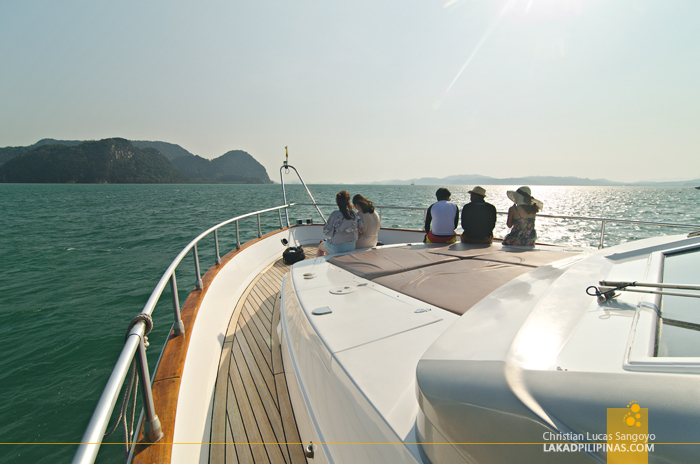 The boat started to smoothly part the sea as we went looking for a place to settle down. 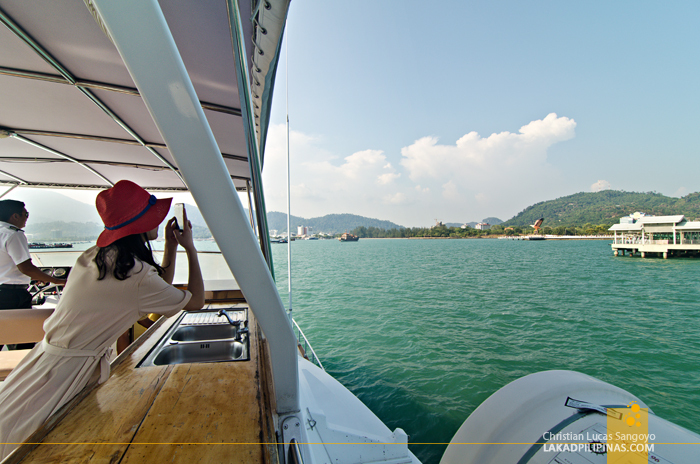 We first sat at the top deck of the boat for a panoramic view of the bay, but decided it was too hot for us. 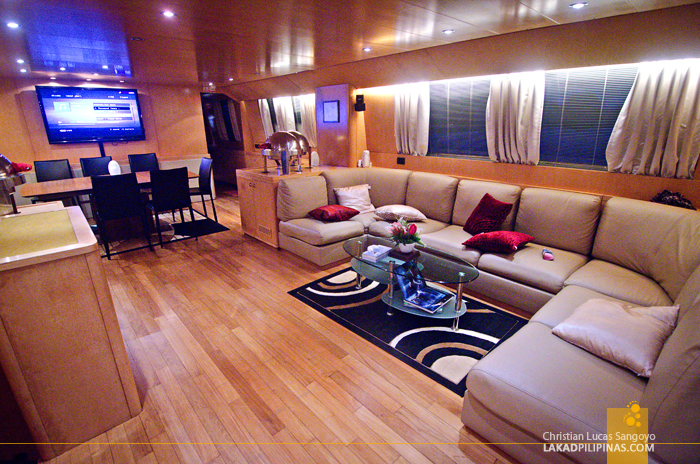 We finally settled at the back part of the boat’s lower deck where a comfy sofa was set along with a sturdy table, perfect for beer drinking; and with a full view of the Andaman Sea too! 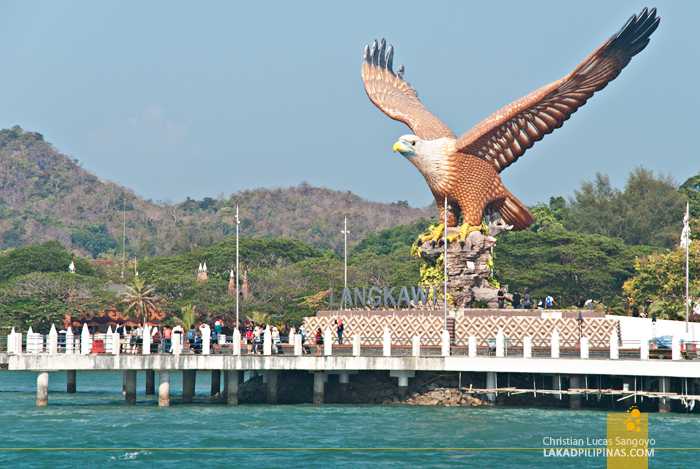 We passed by Langkawi’s Dataran Lang or Eagle Square, where the island’s larger than life icon stood, a brahminy kite eagle standing on a rock with its wings spread out. 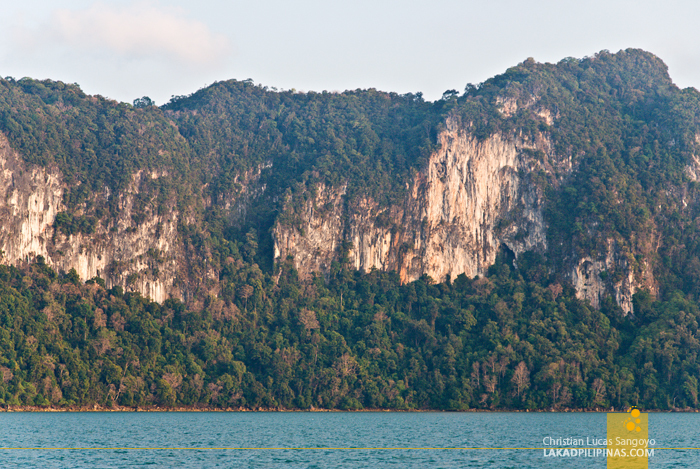 Legend has it that the island got its name from such—helang (eagle) and kawi (the reddish brown color of the brahminy kite eagle), hence, Langkawi. 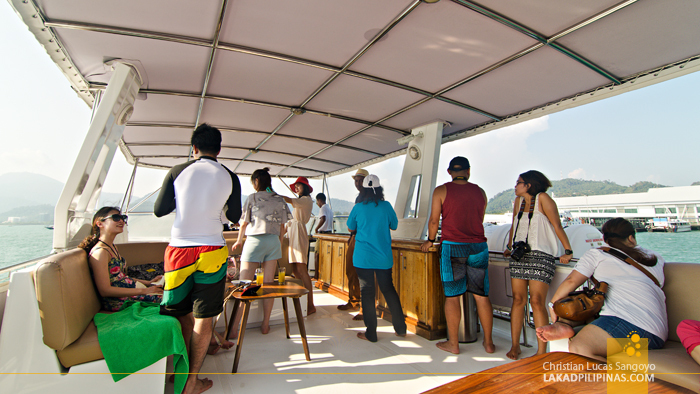 After everyone had taken a snap for their Instagram, our catamaran revved up and proceeded farther out to the sea. 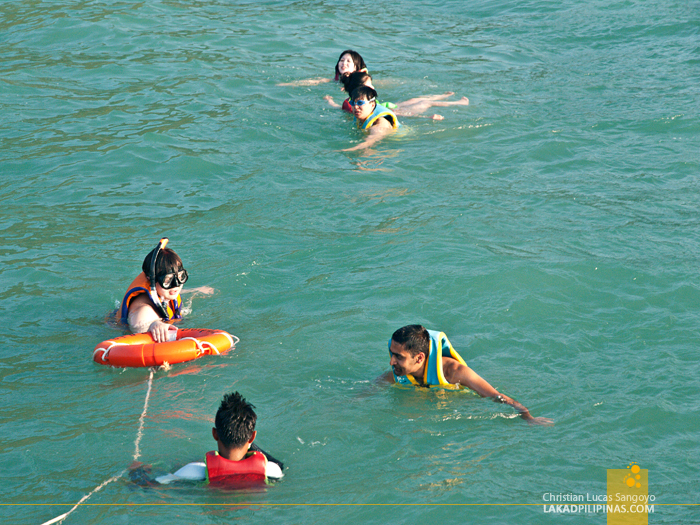 We laid anchor somewhere along Bumbon Besar Island (I think), and everyone who wished to swim were asked to don their snorkels and life vests on. Their rules; no life vest, no swimming (to our protest!). I’M THE LAST ONE IN, WAIT FOR ME! To be fair, the life jacket did help as the current was quite strong that day. I jumped with my underwater camera, hoping to catch a glimpse of corals and fishes, but water clarity was quite bad, I didn’t see anything at all. The current pulled me quite a ways away from our boat and it took me a while to get back. I was the last one in; and to think that I didn’t want to put a vest on too, lol. 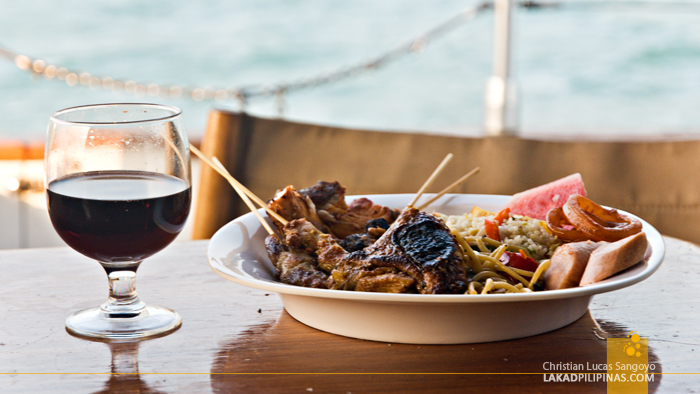 CHEERS TO LUXURY TRAVELS! LOL! An early dinner came right after; satay, cut sausages, pasta, fried rice, grilled squid and Buffalo wings. It was a bit limited but I never did mind, everything was quite superb! I especially dig the chicken and the satay, it went perfectly well with a cold can of Tiger Beer. I couldn’t count how many cans we’ve downed when the sky started to glow in hues of reds. We took a break from our beer and took a peek in front of the catamaran. It was one of the most beautiful sunsets I’ve seen in Malaysia, the sun, a perfect circle, the sky, fired to an intense deep orange. A toast was definitely in place. 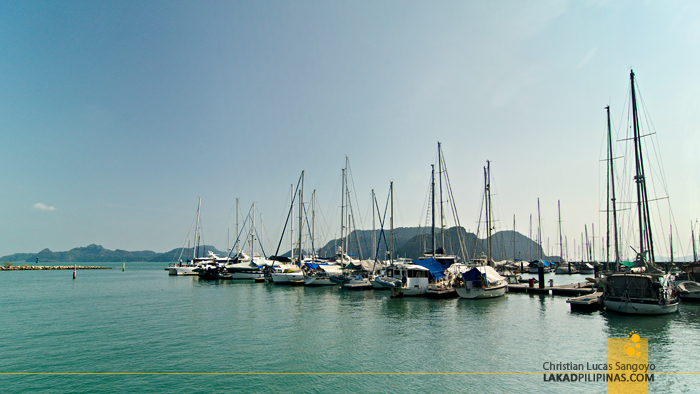 Cheers to a perfect day in Langkawi!